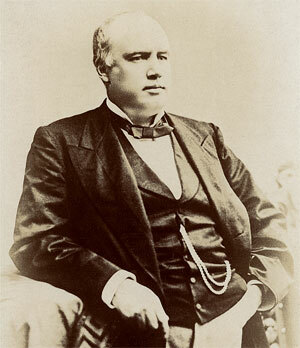 Robert Green Ingersoll (1833-1899) was the best-known orator and political speechmaker of 19th-century America. A hero of the Civil War nationally famed as an attorney, Ingersoll criss-crossed the country addressing packed houses on politics, ethics, human freedom, and religious topics. He spoke against slavery and opposed the Religious Right of his day. A Republican activist when that was the party of Lincoln, Ingersoll campaigned powerfully for every Republican presidential candidate but one from Grant to McKinley. His “Plumed Knight” speech nominating James G. Blaine for the presidency set a standard by which political oratory was measured for more than a quarter of a century. In the Golden Age of American oratory, no speaker was heard by more American men and women — nor sparked greater controversy — than Robert Green Ingersoll. 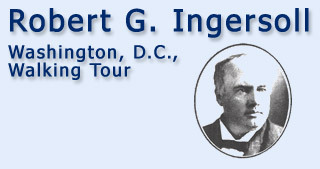 This website contains a virtual tour of Robert Ingersoll’s Washington, D.C., as well as a printable self-guided walking tour. The tour takes you through the oldest parts of Washington, D.C., to visit the sites where Ingersoll lived, worked, or spoke. However, due to commercial development, most of the actual buildings have been replaced with modern structures. This beautiful walk comprises about two dozen city blocks — two miles — and takes about two hours. An abbreviated walk of twelve blocks — one mile — takes a little over one hour.